Eisermann, K., E. Matías & C. Avendaño (2017) Primer registro de anidación de Psiloscops flammeolus en Guatemala. Cotinga 39: 53-59. Eisermann, K. (2017) A new locality and elevational range extension for Rhinophrynus dorsalis Duméril & Bibron, 1841 (Anura: Rhinophrynidae), and a noteworthy record for Hypopachus variolosus (Cope, 1866) (Anura: Microhylidae) in Guatemala. Mesoamerican Herpetology 4: 688-692. Schulz, U. & K. Eisermann (2017) Morphometric differentiation between subspecies of Resplendent Quetzal (Pharomachrus mocinno mocinno and P. m. costaricensis) based on male uppertail-coverts. Bulletin of the British Ornithologists' Club 137: 287-291. Eisermann, K. & M. Acevedo (2016) A new locality for the Endangered Abronia gaiophantasma Campbell and Frost, 1993 (Squamata: Anguidae) in Alta Verapaz, Guatemala, with notes on morphology. Mesoamerican Herpetology 3: 1085-1089. Eisermann, K., C. Avendaño, E. Matías & M. Acevedo (2016) Elevational range extension and a new habitat for Thamnophis fulvus (Bocourt, 1893) (Squamata: Natricidae). Mesoamerican Herpetology 3: 1094-1097. Eisermann, K., C. Avendaño & P. Tanimoto (2013). Birds of the Cerro El Amay Important Bird Area, Quiché, Guatemala. Cotinga 35: 81-93. Enríquez, P. L., K. Eisermann & H. Mikkola (2012) Los búhos de México y Centroamérica: necesidades en investigación y conservación. Ornitología Neotropical 23, Suppl. : 247-260. Schulz, U. & K. Eisermann (2012) Morphologische Unterscheidung von Guatemala-Quetzal Pharomachrus mocinno und Costa-Rica-Quetzal P. costaricensis anhand der Schmuckfedern. Ornithologischer Anzeiger 51: 70-74. Eisermann, K., S. Arbeiter, G. López, C. Avendaño & J. d. León Lux (2011) Distribution, habitat use, and implications for the conservation of the globally threatened Azure-rumped Tanager Tangara cabanisi in Guatemala. Bird Conservation International 21: 423-437. Eisermann, K., G. López, J. Berry, J. de León Lux & A. Burge (2011) Vocalisations and juvenile plumage of the Azure-rumped Tanager. Cotinga 33: 23-26. Eisermann, K. & C. Avendaño (2009) Conservation priority-setting in Guatemala through the identification of Important Bird Areas. Proceedings of the Fourth International Partners in Flight Conference, Tundra to Tropics: 315-327. Eitniear, J. C. & K. Eisermann (2009) Status and recent sightings of Ocellated Quail. International Journal of Galliformes Conservation 1: 85-93. Eisermann, K. & K. Omland (2007) Coloration anomaly of a male Collared Trogon (Trogon collaris). Acta Zoológica Mexicana (n.s.) 23(2): 197-200. Eisermann, K., A. Burge & G. López (2007) Nesting records of Horned Guan (Oreophasis derbianus) on Atitlán volcano, Guatemala. Bulletin of the IUCN / BIRDLIFE / WPA Cracid Specialist Group 23: 13-24. 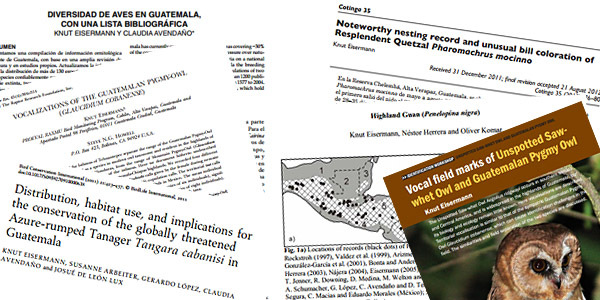 Eisermann, K. & D. M. Brooks (2006) Unusual and noteworthy nesting records for Guatemala. Cotinga 26: 48-51. Grijalva, B. & K. Eisermann (2006) Observación de un inmaduro de Morphnus guianensis en Tikal, Petén, Guatemala. Pato-Poc 3: 26-29. 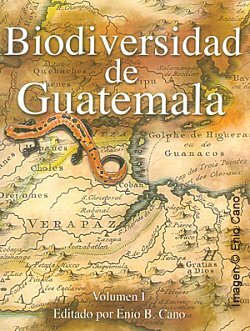 Heinrichs, N., K. Eisermann & C. Avendaño (2006) Conteo de aves rapaces migratorias en la vertiente pacífica de Guatemala en octubre y noviembre 2005. Pato-Poc 3: 10-17. Eisermann, K. (2005) An observation of foliage-bathing by an Orange-breasted Falcon (Falco deiroleucus) in Tikal, Guatemala. Wilson Bulletin 117: 415-418. Eisermann, K. & U. Schulz (2005) Birds of a high-altitude cloud forest in Alta Verapaz, Guatemala. Revista de Biología Tropical 53: 577-594. 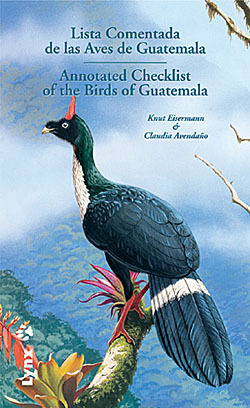 Eisermann, K. (2005) Noteworthy bird observations in Alta Verapaz, Guatemala. Bulletin of the British Ornithologists’ Club 125: 3-11. Eisermann, K. & C. Avendaño (2004) American White Pelican Pelecanus erythrorhynchos in interior Guatemala. Cotinga 22: 98-99. Eisermann, K. & U. Schulz (2002) Ermittlung von Vogel-Zielarten für ein Regenwaldschutzprojekt. (Bird target species for a rain forest conservation project.) Beiträge für Forstwirtschaft und Landschaftsökologie 36: 14-17. Schulz, U. & K. Eisermann (2001) Significant Resplendent Quetzal Pharomachrus mocinno population found in an unprotected forest in Guatemala. Cotinga 15: 4. 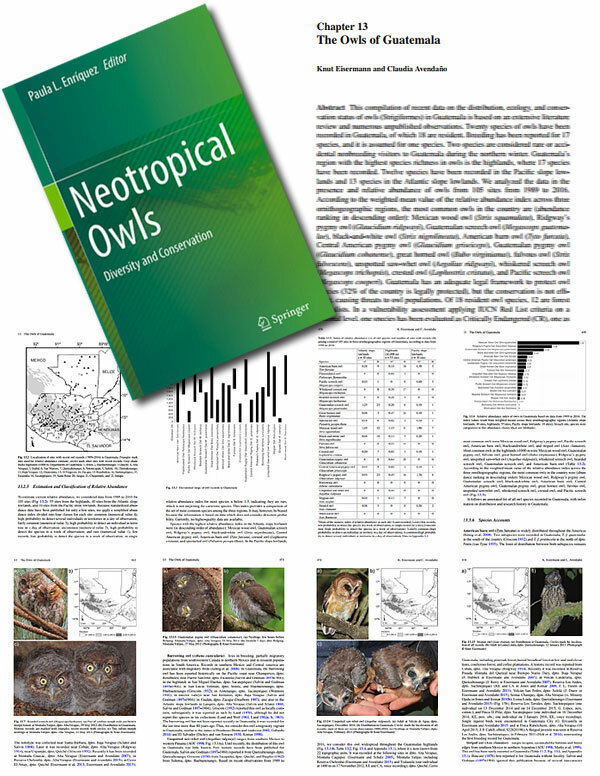 Enríquez, P. L., K. Eisermann, H. Mikkola & J. C. Motta-Junior (2017) A review of the systematics of Neotropical owls (Strigiformes). 7-19 in P. L. Enríquez (ed.) 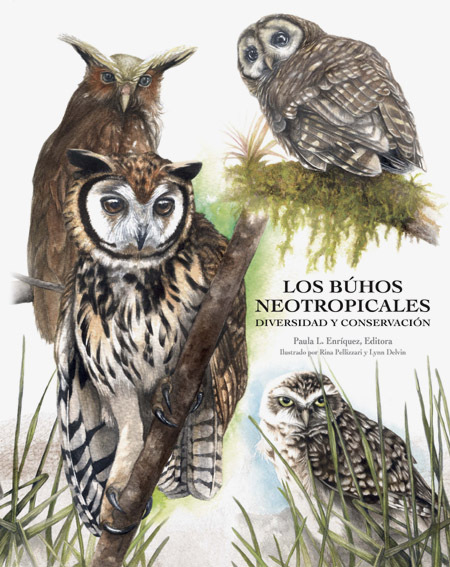 Neotropical owls: diversity and conservation. Springer, Cham, Switzerland. Enríquez, P. L., K. Eisermann, J. C. Motta-Junior & H. Mikkola (2015) Una revisión de la taxonomía y sistemática de los búhos neotropicales. 29-38 in P. L. Enríquez (ed.) Los búhos neotropicales: diversidad y conservación. ECOSUR, San Cristóbal de las Casas, Chiapas, México. Eisermann, K. & C. Avendaño (2009) Guatemala. Pp. 235-242 In: C. Devenish, D. F. Diaz Fernández, R. P. Clay, I. Davidson & I. Y. Zabala (eds.) Important Bird Areas Americas, priority sites for biodiversity conservation. BirdLife Conservation Series 16. Birdlife International, Quito, Ecuador. Eisermann, K. (2011) Azure-rumped Tanager Tangara cabanisi: from ornithological enigma to conservation flagship. Neotropical Birding 9: 44-50. Eisermann, K. (2008) Zerstörung der Natur aufhalten - nicht nur vor der eigenen Haustür: NABU-Regionalverband Erzgebirge unterstützt Schutz des Nebelwaldes in den Yalijux Bergen. NABU-Report Sachsen 2008: 35-36. Eisermann, K. (2007) Important Bird Areas in Guatemala. Winging It 19, no.5: 11. Eisermann, K. (2007) Vogelreichtum in Guatemala: endemische Arten, IBAs und nachhaltige Bewirtschaftung. Falke 54: 385-391. Eisermann, K. (2005) Bericht über das Vogelmonitoring in Guatemala. Rundschreiben des Vereins Sächsischer Ornithologen 24: 15-17. Eisermann, K. (2003) Vom Aussterben bedroht: Die Große Gelbkopfamazone in Guatemala. Gefiederte Welt 127: 206-207. Schulz, U. & K. Eisermann (2001) Kolibri-Beobachtungen in einer Nebelwaldregion Guatemalas. Gefiederte Welt 125: 340-342. Eisermann, K. & C. Avendaño (2007) Áreas propuestas para la designación como IBA (Área importante para la conservación de aves) en Guatemala, con una priorización para la conservación adentro de las IBAs y una evaluación de las IBAs para aves migratorias Neárticas-Neotropicales. Informe final a BirdLife International, Quito, Ecuador. Sociedad Guatemalteca de Ornitología, Guatemala. Eisermann, K. (2006) Evaluación de la Avifauna del Sitio Arqueológico Río Amarillo, Santa Rita, Copán, Honduras. Anexo 1 In Komar, O., J. P. Arce, C. Begley, F. E. Castañeda, K. Eisermann, R. J. Gallardo & L. Marineros. Evaluación de la biodiversidad del Parque Arqueológico y Reserva Forestal Río Amarillo (Copán, Honduras). Informe de Consultoría para el Banco Interamericano de Desarrollo. SalvaNATURA Programa de Ciencias para la Conservación, San Salvador, El Salvador y NatureServe, Washington, D.C., USA. Eisermann, K. (2001) Caracterización de la avifauna del Área de Protección Especial Punta de Manabique, Izabal, Guatemala. Fundación Mario Dary, Guatemala. Eisermann, K. (1999) Avifaunistisch-ökologische Untersuchungen in einer Nebelwaldregion Guatemalas als Grundlage für die Entwicklung eines Biomonitoringprogramms. Thesis, University of Applied Sciences Eberswalde, Germany. Knut Eisermann compiló registros notables de aves en Guatemala para el informe trimestral de Centro América de 2004 a 2015. Jones, H. L. & O. Komar (2012) The fall migration, August through November 2011: Central America. North American Birds 66: 182-187. 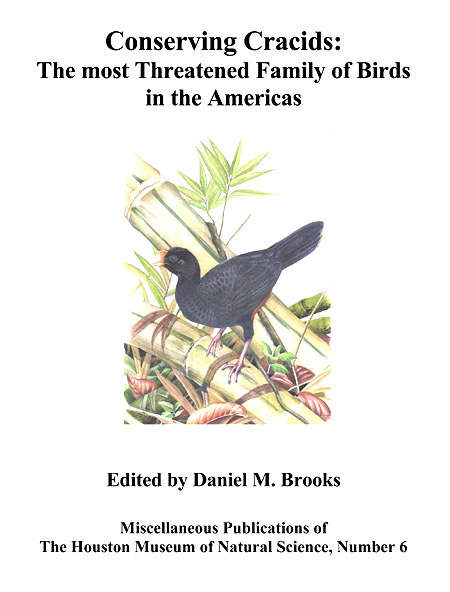 Jones, H. L. & O. Komar (2012) The nesting season, June through July 2011:Central America. North American Birds 65: 693-696. Jones, H. L. & O. Komar (2011) The spring migration, March through May 2011: Central America. North American Birds 65: 528-534. Jones, H. L. & O. Komar (2011) The winter season, December 2010 through February 2011: Central America. North American Birds 65: 350-356. Jones, H. L. & O. Komar (2011) The fall migration, August through November 2010: Central America. North American Birds 65: 174-180. Jones, H. L. & O. Komar (2011) The nesting season, June through July 2010: Central America. North American Birds 64: 654-655. Jones, H. L. & O. Komar (2010) The spring migration, March through May 2010: Central America. North American Birds 64: 507-510. Jones, H. L. & O. Komar (2010) The winter season, December 2009 through February 2010: Central America. North American Birds 64: 333-336. Jones, H. L. & O. Komar (2010) The fall migration, August through November 2009: Central America. North American Birds 64: 164-168. 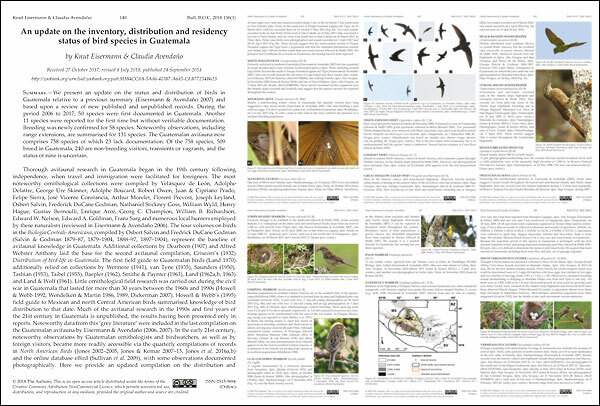 Jones, H. L. & O. Komar (2010) The nesting season, June through July 2009: Central America. North American Birds 63: 662-663. Jones, H. L. & O. Komar (2009) The spring migration, March through May 2009: Central America. North American Birds 63: 513-518. Jones, H. L. & O. Komar (2009) The winter season, December 2008 through February 2009: Central America. North American Birds 63: 335-339. Jones, H. L. & O. Komar (2009) The fall migration, August through November 2008: Central America. North American Birds 63: 167-172. Jones, H. L. & O. Komar (2009) The nesting season, June through July 2008: Central America. North American Birds 62: 626-628. Jones, H. L. & O. Komar (2008) The spring migration, March through May 2008: Central America. North American Birds 62: 487-491. Jones, H. L. & O. Komar (2008) The winter season, December 2007 through February 2008: Central America. North American Birds 62: 314-318. Jones, H. L. & O. Komar (2008) The fall migration, August through November 2007: Central America. North American Birds 62: 163-170. Jones, H. L. & O. Komar (2008) The nesting season, June through July 2007: Central America. North American Birds 61: 648-651. Jones, H. L. & O. Komar (2007) The spring migration, March through May 2007: Central America. North American Birds 61: 521-525. Jones, H. L. & O. Komar (2007) The winter season, December 2006 through February 2007: Central America. North American Birds 61: 340-344. Jones, H. L. & O. Komar (2007) The fall migration, August through November 2006: Central America. North American Birds 61: 155-159. Jones, H. L. & O. Komar (2007) The nesting season, June through July 2006: Central America. North American Birds 60: 587-588. Jones, H. L. & O. Komar (2006) The spring migration, March through May 2006: Central America. North American Birds 60: 451-455. Jones, H. L. & O. Komar (2006) The winter season, December 2006 through February 2006: Central America. North American Birds 60: 296-299. Jones, H. L. & O. Komar (2006) The fall migration, August through November 2005: Central America. North American Birds 60: 152-156. Jones, H. L. & O. Komar (2006) The nesting season, June through July 2005: Central America. North American Birds 59: 662-664. Jones, H. L. (2005) The spring migration, March through May 2005: Central America. North American Birds 59: 506-510. Jones, H. L. (2005) The winter season, December 2004 through February 2005: Central America. North American Birds 59: 337-340. Jones, H. L. (2005) The fall migration, August through November 2004: Central America. North American Birds 59: 162-165. Jones, L. (2004) The nesting season, June through July 2004: Central America. North American Birds 58: 611-612. Jones, L. (2004) The spring migration, March through May 2004: Central America. North American Birds 58: 446-448.